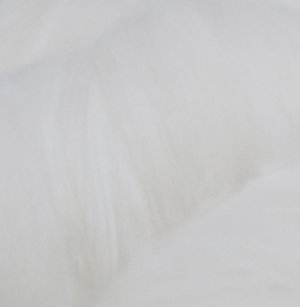 ﻿ Cashmere Angora Merino Fibers from Weaver Creek Fibers, wholesale purveyors of luxury fibers. Cashmere/Angora/Merino is a dreamy blend of three beautifully soft fibers. It consists of 20% Mongolian Cream Cashmere, 20% pure white angora rabbit hair, and 60% Merino Wool. The cashmere gives the fiber a bit of a buttery hand and the angora will give a delightful halo. We recommend that you give this blend lots of twist, when spinning and plying. It takes dye beautifully. Our cleaned, dehaired and combed Mongolian Cashmere Angora Merino top is available in cream. The staple length is 2.08 inches (52mm) and has an approximate micron of 16. It is also available blended with Merino only.